If the golden rule of academia is to "publish or perish," then preparing a journal article for publication is like death by a thousand paper cuts, as countless issues must be corrected, from improperly cropped images to wastefully excised content. 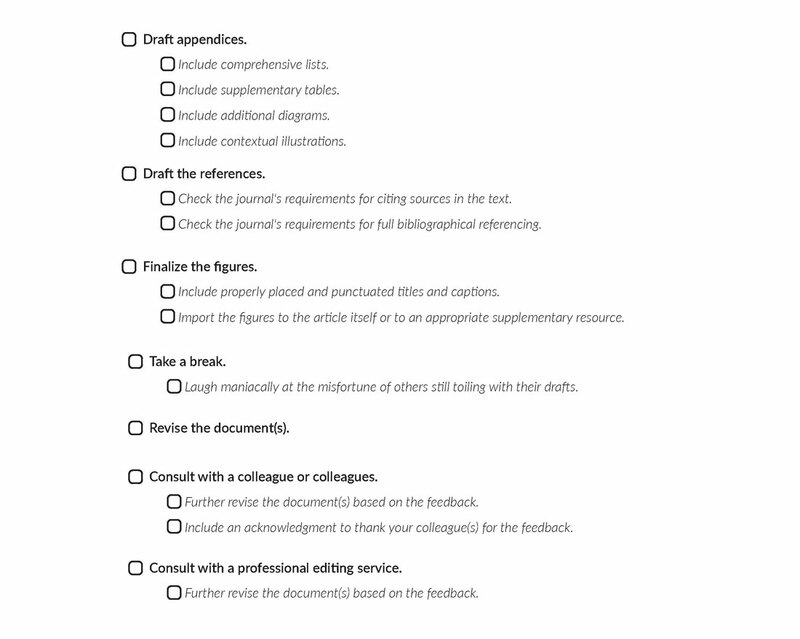 This ultimate journal article submission checklist will help you organize, chronologize, and prioritize each aspect of article preparation for academic journal article submission. It is assumed that you have already formulated your hypotheses, determined your methods, gathered your materials, conducted your research, verified your results, and drawn your conclusions. Now, you are ready to put it all together in a coherent text. Rather than assume that you have already written a full draft of your article, we begin this checklist by breaking the habit of thinking about submission only after you are done writing. The sooner you start thinking about submission requirements, the better; conditions for submission should affect how you write your article. Sometimes, the conditions are dependent on your discipline. Scientific studies, for example, can have different writing requirements than those of an essay in the humanities (e.g., authorial tone, presentation of evidence, citation of sources). Other times, the conditions are more specific to your target journal (e.g., margin formatting, heading numbers, image captions). 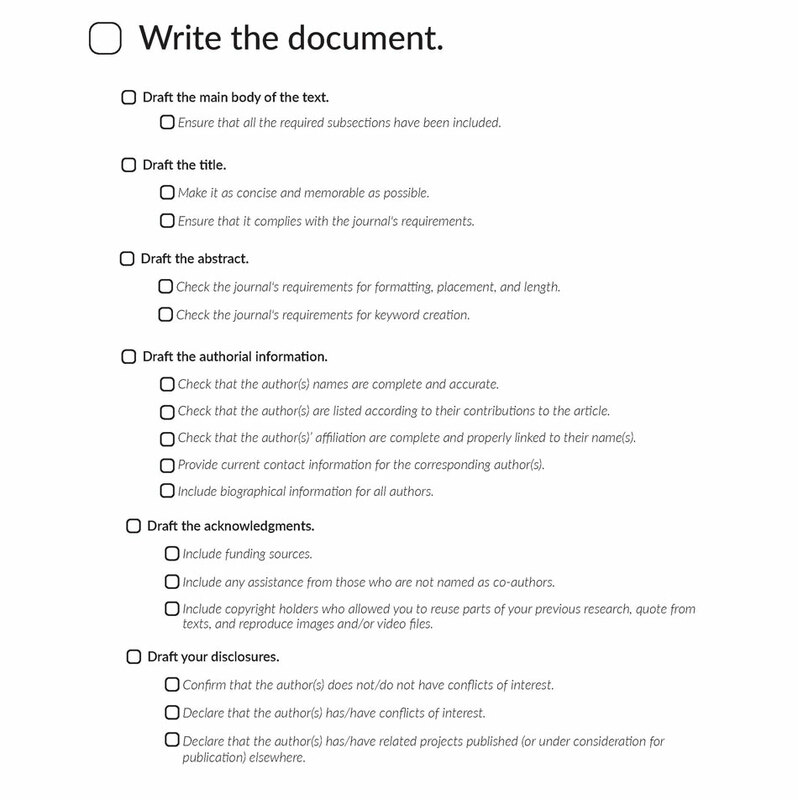 The sequential sections of this checklist are broad enough to encompass all disciplines, though individual details may vary from one journal to another. 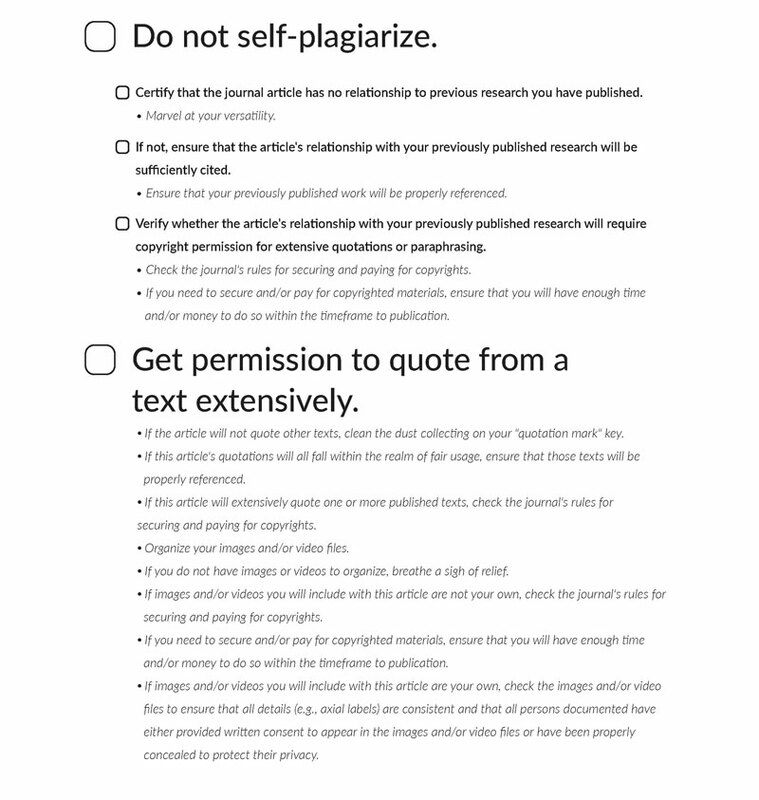 You can follow along with the article to ensure that you have followed all the necessary steps before journal article submission, or you can download Scribendi's Ultimate Journal Article Submission Checklist to print out so you can follow along. Selecting a target journal is the crucial first step, but how do you select one? Your topic may be specific enough that you have always had one journal in mind. If not, and if you are unsure about which journal to approach with your article, consider reviewing the sources that guided your research. If several of your sources were published in the same journal, that journal is likely a good fit for your article. If your sources have been published in a variety of leading journals (which is often the case), consider which journal is the most prestigious in your field (e.g., its impact factor). Also consider which aspect of your research you wish to highlight in your journal article. Choose the most prestigious periodical that has published the most sources you will use for that specific aspect of your journal article submission. Furthermore, if you still need to choose from a group of potential target journals, have a quick look at the journals' respective limitations (e.g., word count, image count, referencing limits). This will let you determine the best available fit with the proposed scope of your article. Finally, while scanning the limitations of prospective journals, consider your timeframe for publication. If you must publish your research quickly to stay ahead of the competition or for the sake of a performance review, pay attention to the general timeframe, from submission to publication, for any given journal. If Journal Alpha takes two months to receive, acknowledge, peer review, and publish an article, while Journal Beta takes six months to perform the same actions, perhaps a more time-sensitive article should be published with Journal Alpha, even if it is less prestigious than Journal Beta. Likewise, if Journal Alpha releases an accepted version of an article online prior to final publication and Journal Beta does not provide that preliminary service, perhaps a more time-sensitive article should be submitted to the former journal. The positioning of this step may seem totally wrong, but you should give copyright issues serious consideration as soon as possible! First, consider how the research for this journal article aligns with the research from your previously published articles as the author or coauthor. Did you rely on ideas that you (or a coauthor) had developed in a previous paper? Is it enough to cite that previous document, or did you reuse specific portions of that text? If the latter, you will likely need to get permission from the copyright holder of the other publication. The good news is that academic publishers are often happy to let you reuse parts of your own ideas (with the appropriate citation to the original document and perhaps a note of gratitude in the acknowledgments). Second, consider whether your journal article submission will include quotations from other texts and whether those quotations will fall within the realm of fair usage. Obviously, if you did not quote directly from other sources, this will not be an issue for you. However, for those of you who did quote extensively from other sources, check your target journal's guidelines to determine whether you need to get permission to quote certain texts. Copyright clearance can be quite time consuming and costly to procure, so check whether your target journal has staff dedicated to securing the rights to reproduce texts and whether your target journal has funds dedicated to cover the costs of copyrighted materials. If the answer is "no" to either or both conditions, start organizing these materials promptly. A copyright holder who denies your request may drastically change the content of your proposed journal article. Third, consider whether you will include images and/or video files with your article. For those of you who will publish an article with nothing but words (and many journals, based on discipline and/or cost, do not require images or videos), this step can be skipped. But, for those of you who must include images (pictures, diagrams, graphs, etc.) and/or videos, there are several factors to keep in mind. If your images and/or video files are not your own materials (e.g., archived photographs, previously established schematics, celebrated works of art), consider your target journal's procedures to secure the rights to reproduce those materials (as per the journal's procedures to reproduce copyrighted text, in the paragraph above). If your images and/or videos are your own materials (e.g., graphs generated through software associated with your research experiments or video recordings documenting your experimental setup), confirm that anyone appearing in the documents has given you written consent to use their likeness (or that you have sufficiently concealed their likeness). For your own materials, it is also best to check that the documents are consistent before you begin writing about them. If the axial label on one graph lists "Energy (kWh)" and another lists "Energy (kW h)," it would be best to redesign the graphs immediately, with one consistent expression for the unit of measurement (ideally, based on the target journal's preferences). You have selected your target journal and considered copyright issues; now, it's time to start writing . . . almost. Before writing, you need to establish the formatting of the document(s) you will submit to the publisher. Some journals prefer one file format over another (e.g., a PDF rather than a Word document or multiple paper copies rather than a LaTeX file). 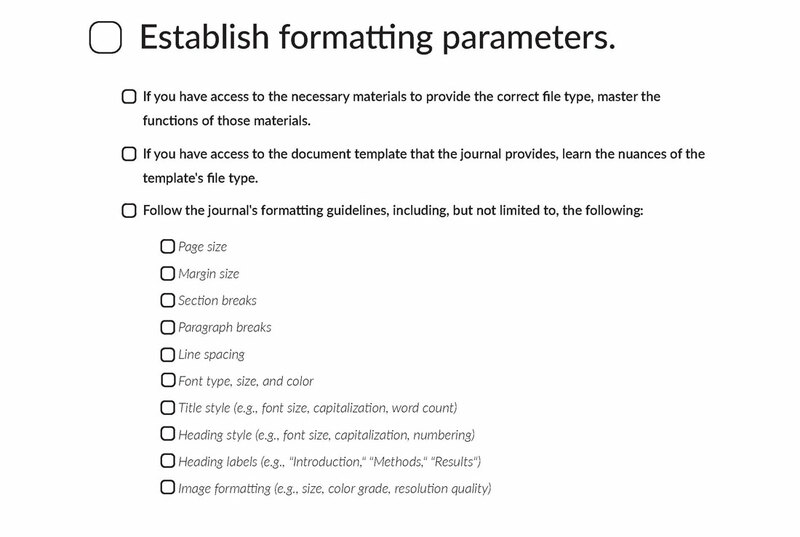 Some journals provide templates (e.g., standardized Word documents or pre-encoded LaTeX files) to ensure consistency in formatting, but others simply list their rules for page size, font size, line spacing, heading style, etc. The key is to follow the publisher's rules precisely to make the best first impression. If the publisher provides a template, use it. If the publisher lists formatting rules, follow them. Period. There are plenty of articles to help you with this part of the process (e.g., "The Ultimate Essay Checklist"). Without belaboring the point, it is enough to recommend that you write the main body of the text first, from introduction to conclusion. Second, develop a pithy title to catch the reader's attention; it should be informative and perhaps (depending on your audience) witty. Third, compose your abstract as a concise summary of the article's full scope, following the journal's requirements for abstract length, structure, and keyword creation. Fourth, provide all necessary authorial information, including your complete and accurate name(s), appropriate ranking of the authors in terms of contributions to the article (if you have written a coauthored journal article submission), proper affiliations for the author(s), current contact information for the corresponding author(s), and biographical information for the author(s), if needed. Fifth, acknowledge all support you received for this project, including (but not limited to) scholarships, grants, permissions, and non-authorial assistance (e.g., from students). Sixth, disclose any conflicts of interest. Seventh, create all necessary appendices, such as supplementary tables or additional diagrams. Eighth, organize your references, checking the relationship between the citations in the text itself (e.g., parenthetical citations or referential digits, depending on the journal) and the full bibliographical materials (e.g., thorough footnotes or a final reference list, depending on the journal). Finally, title, caption, and import the figures (for those of you using image and/or video files) either directly within the article or, more likely, as a separate document or folder of images and/or videos. Once you have completed a full draft of your journal article and its supporting features, you should take a break (an hour, a day, a week, or even a month, depending on your timeframe) before returning to it for revisions. When in the midst of writing your first full draft, all writing may sound great, seem essential, and appear error free. However, after you have stepped away from the document for a while, your refreshed eyes will have a better chance of detecting awkward prose, tangential thoughts, and glaring errors. Eliminate these. You should also have a friend, colleague, or professional editing service read the draft and provide feedback to ensure that your text is clear, concise, and compliant with the guidelines of your target journal. With all the details of the journal article finalized, you are now ready to submit the document(s). First, confirm that the various parts of your article (e.g., the text and the images) are compliant with the journal's requirements. For example, if the journal requests that documents be labeled by lead author surname, short title, and then the word "Manuscript" or "Supplements," follow the phrasing exactly. Second, start preparing all other information that may be necessary as part of the publication process. For example, if you are submitting to a peer-reviewed journal, the journal's editors may request that you provide a list of potential peer reviewers for them to contact. Have this list ready in case the journal editors request this information right away. As with your selection of a target journal, your list of peer reviewers should include authors from key sources cited in your article. Third, write a cover letter to the journal's editors, enticing them to read your journal article submission. You have worked hard to complete the document(s) and are thrilled with your results. Make your future editors thrilled to discover your hard work, as well. Finally, send all the materials to the editors. 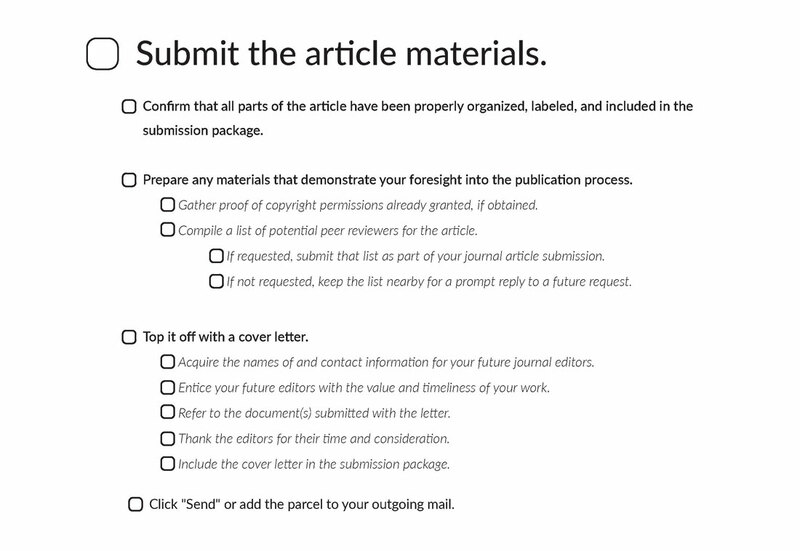 After following these steps, you will be more than ready to submit your journal article (at last!). 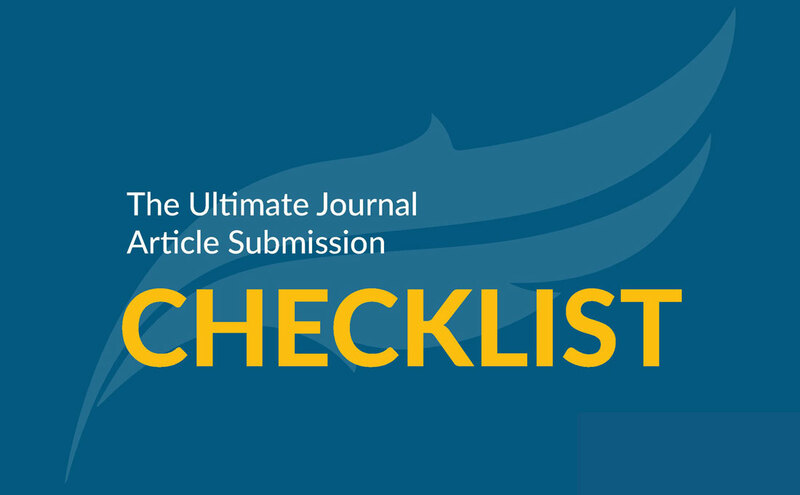 Don't forget to download Scribendi's Ultimate Journal Article Submission Checklist for free to prepare your article and ensure that your journal article is submission ready. Happy writing! Download Scribendi's Ultimate Journal Article Submission Checklist for free! Cameron is an in-house editor at Scribendi. He holds a PhD in the history and theory of architecture, specializing in the relationship between text and architecture. He is also a published scholar, having published one monograph, two book chapters, two exhibition catalogs, one interview, four journal articles, 17 conference papers, and counting! 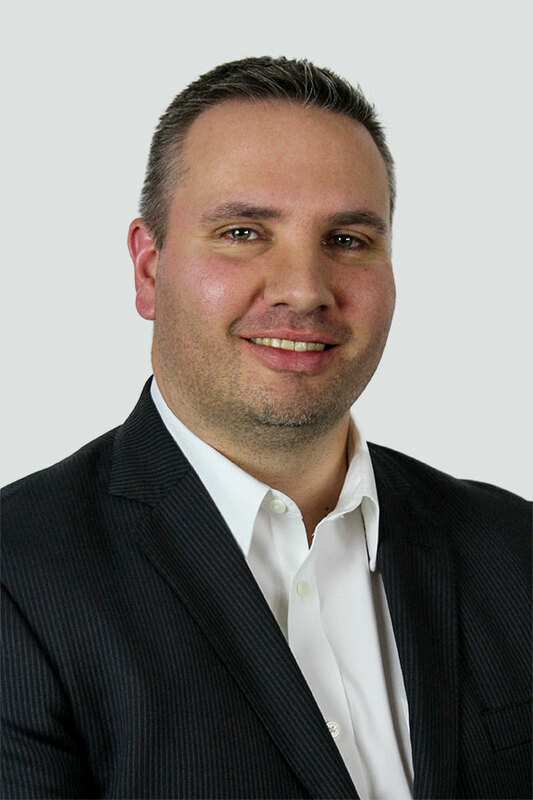 He also has nearly 20 years of teaching experience at universities throughout the world, putting his pedagogical skills to good use when crafting blog posts for Scribendi. Establish authority with your audience and communicate your message clearly with Scribendi's Editing and Proofreading Checklist.